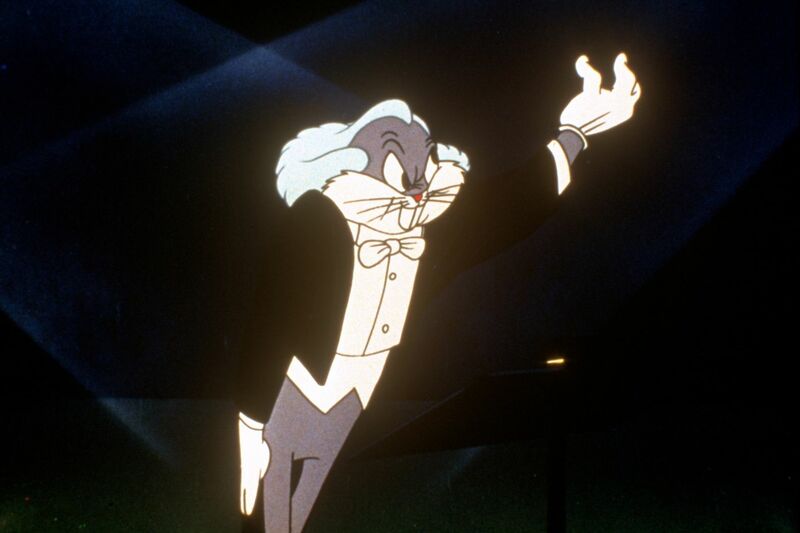 Bugs Bunny as Leopold Stokowski in "Long-Haired Hare"
Don’t bet on it, dad. One of the keys to being a wise parent, it seems to me, is knowing when to keep your mouth shut and accept victory, and Saturday night’s unusual Philadelphia Orchestra concert was a victory all around. Bugs Bunny and other cartoon characters worked their puckish charm on various celluloid victims as well as listeners who seemed only too delighted to hear Rossini, Smetana, and others sliced and diced to accompany any number of chase scenes and Coyote getting blown to smithereens. Conductor George Daugherty has been bringing his live-orchestra-with-silver screen Bugs Bunny show to orchestras across the country for several decades now. Though the Philadelphia Orchestra has done it at the Mann Center before, the ensemble has never performed it indoors, downtown, as it did last weekend. The demographics were notable. Even if Bugs Bunny’s earliest fans are now drawing Social Security, Saturday’s audience was quite young. It looked like date night for some, and others brought children. Two of the three shows were sold out. Many an orchestra or opera fan today claims to have heard her first Wagner emanate from beneath a horned helmet worn by Elmer J. Fudd (“Oh Brünnhilde, you are so lovely.”). I’m skeptical of the idea that these cartoons all by themselves were a gateway into classical music for large numbers of listeners. More likely it was the fact that classical music was just part of the atmosphere in the middle of the 20th century, and hearing this music on Saturday mornings was one more way to reinforce these tunes in your brain. But there is an affirming feeling to being in a hall full of others responding to and applauding a common cultural experience, which clearly was the case Saturday night. Daugherty primed the audience and told them to look for a local connection in “Long-Haired Hare.” “It’s Leopold, it’s Leopold,” the crowd chanted when Bugs Bunny mounted the podium on the big screen in the persona of Leopold Stokowski, the orchestra’s first star music director. The show, called “Bugs Bunny at the Symphony II,” was a stream of a dozen and a half cartoons, most shown with the live Philadelphia Orchestra playing the scores. Daugherty explained some of the history behind the original animation and sound design, including that decidedly unorchestral twang that opens the Merrie Melodies intro: a slide guitar. Touring percussionist Jo Pusateri, Daugherty said, was on hand playing the original (restored) 1930 instrument used for that madcap music. Was the orchestra overshadowed? It’s an increasingly common question these days as this group finds itself playing more film soundtracks and visually oriented shows. There were definitely moments when Bugs sucked up all available oxygen. The compilation of cartoons was heavy on classical references — Tom and Jerry, for instance, in “Johann Mouse,” and “Rhapsody Rabbit,” which leans on Liszt. The Road Runner cartoon “Zoom and Bored,” with a genius score by Carl W. Stalling and Milt Franklyn, had the orchestra turning on a dime, strings racing one moment and flutist Patrick Williams suggesting a bird the next. “The Rabbit of Seville” was the unlikely source of a certain yearning. It’s full of silliness, of course, both on screen and in the way Rossini’s music is manipulated. But when you heard the sound of this orchestra’s rich horns or the transparency of Peter Smith’s oboe, you couldn’t help but wish for the real, sincere thing the orchestra plays in this hall most other nights. In other words, that’s not all, folks.